Although unnoticed by foreign analysts, Xi Jinping recently signaled a desire to dial back tensions in the South and East China Seas. At the end of July, the Chinese Communist Party’s ruling Politburo held a special study session on the nation’s growing maritime power, which has helped cause controversy with several neighboring states. Official media reports about the meeting emphasized a speech by President Xi Jinping that repeated the main policy themes from the recent 18th Party Congress, calling for China to become a major maritime power by developing its maritime resources and protecting the ocean environment. But Xi’s most interesting remarks have received scant attention. 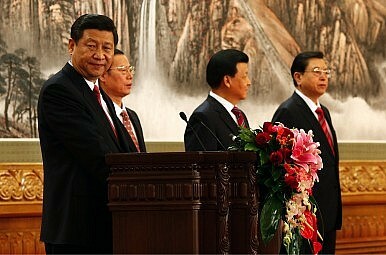 Under China’s system of collective leadership, speeches at Politburo meetings usually reflect the consensus of the participants – in this case, China’s top 25 leaders. Near the end of his address at the most recent study session, Xi discussed China’s ongoing maritime disputes and predictably repeated many now common talking points, such as “never giving up its legitimate rights and interests,” especially the nation’s core interests. Nevertheless, two other phrases he used may illuminate how Beijing may handle these disputes and therefore deserve greater attention. Xi’s remarks suggest that Beijing may be reconsidering the merits of its most assertive actions in the East and South China Seas—ones that have caused grave diplomatic problems with Japan and many Southeast Asian countries. First, Xi repeated the late Deng Xiaoping’s 12-character guideline for dealing with territorial disputes over offshore islands such as the Spratlys and Senkaku/Diaoyu. In a series of statements between 1979 and 1984, Deng had outlined his more moderate approach, later summarized as “sovereignty remains ours; shelve disputes; pursue joint development.” In recent years, Chinese scholars and analysts have debated the merits of that approach, sometimes criticized for failing to prevent what have been perceived infringements of Chinese sovereignty. For example, just last year a prominent analyst at the China Contemporary Institutes of International Relations, Chen Xiangyang, called for a more assertive policy. In particular, he suggested that Deng’s guideline be replaced with a tougher approach: “sovereignty of course is ours; maintain the dispute stage; seize the initiative to pursue development; strengthen crisis management and control” (zhuquan dangran zaiwo, jieduanxing baochi zhengyi, zhuajin zizhu kaifa, qianghua weiji guangkong). However, by repeating Deng’s 12-character guideline, Xi endorsed and affirmed Deng’s earlier position on behalf of the entire Politburo (including two of the People’s Liberation Army’s top generals, Fan Changlong and Xu Qiliang). By stating what the party line should be, Xi indirectly addressed the internal debate about Deng’s guideline. Of course, Deng did not offer a plan for resolving the underlying sovereignty disputes, but the Politburo’s affirmation of Deng’s approach indicates that Beijing will be patient, and pursue temporary measures to reduce tensions. It also undermines a growing belief overseas that China is becoming increasingly impatient at sea. A few days later, Foreign Minister Wang Yi illustrated what Xi’s remarks could mean in reality. During a tour of Southeast Asia, Wang indicated that a final resolution could only be achieved through bilateral talks and would “take time,” while progress on a much-needed Code of Conduct for minimizing maritime problems could only be achieved without outside interference (read: the Philippine decision to seek international arbitration rather than direct diplomatic talks). Thus, Wang emphasized “actively” exploring joint development, though he failed to offer any specific details about how to do so.